Байковий цвинтар, 19 листопада 2009 р.
Аудіоархів mp3; Мої пісні; Мої читецькі та акторські роботи. 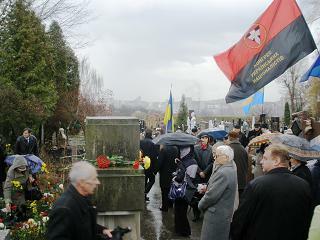 The memorial service was held at Baykove cemetry in Kyiv. 20 years ago, 19.11.1989, the remains of Ukrainian political prisoners Vasyl Stus, Yuri Lytvyn, Oleksa Tykhyi were delivered to Kyiv from forced labour camps where they perished by a special expedition and re-burried at Baykove cemetry. More photos and in higher resolution are here. 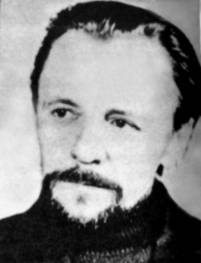 Today is the 25th anniversary of the death in the forsed labour camp “Kuchino” of Ukrainian human rights activist, poet, political prisoner Yuri Lytvyn. His name is usually regarded together with the name of Vasyl’ Stus: Stus died one year after Lytvyn in the same camp; and on the 19th of November 1989 Stus, Lytvyn and Oleksa Tykhyi were re-buried in Kyiv – this event rocked Ukraine at that time. However, we know about Lytvyn much less than about Stus. 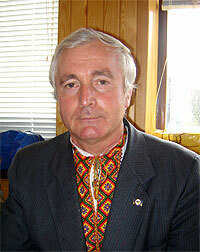 It is a pity, because his life, his works, his soul present a bright star at the spiritual sky of Ukraine. Audio files from this post can be uploaded from the pages: Audio Archive mp3. The exhibition took place in the Museum of Hetmanate. It was opened 23.03.09 and Vjacheslav Chornovil’s sister, Valentyna Chornovil, presented a lecture, referring to the pictures that were exhibited. 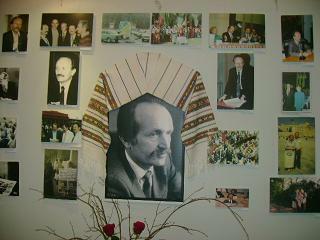 The exhibition was organized by the Museum of Sixties (director – Mykola Plakhotniuk). More photos and in larger size are here. Мій матеріял для Радіо Свобода (5 вересня 2007 р.) про День пам’яти загиблих у комуністичних концтаборах. An interview for RFERL (23.08.2006) with former political prisoners Stepan Khmara and Vasyl’ Ovsijenko on the 15 th anniversary of Ukrainian Independence. 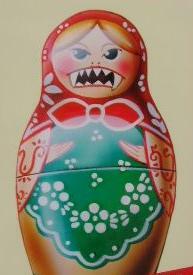 Інтерв’ю на Радіо Свобода (23 серпня 2006 р.) з колишніми політв’язнями Степаном Хмарою та Василем Овсієнком з нагоди 15-ї річниці Незалежності України. Кирило Булкін: – Завтра виповнюється 15 років від дня, коли була проголошена незалежність України. З якими почуттями, з якими очікуваннями зустрічають це свято люди, які присвятили життя боротьбі за незалежність, пожертвували власною волею за часів СРСР заради незалежності, які саме і є гостями Вечірньої Свободи?